I remember my youth pretty well. While my friends were playing their video games, I was out with my father learning to hunt. We'd arrive at our post just before dawn and wouldn't leave until dark. Looking back, an ATV hunting guide would of made our lives a lot easier. If you're anything like my father and I, we brought a number of different rifles to our post. Walking 10 miles just to get to our location was tough enough, let alone carrying four to five rifles each. Now that I hunt on my own, I always take ride my ATV to my location. When I was originally looking at gun racks for my ATV, I wanted to find something that had some versatility. I would often change rifles in season, so I didn't want to lock myself into a gun rack that could only had specific rifles. I narrowed it down to the ATV Gun Rack from Great Day Inc. 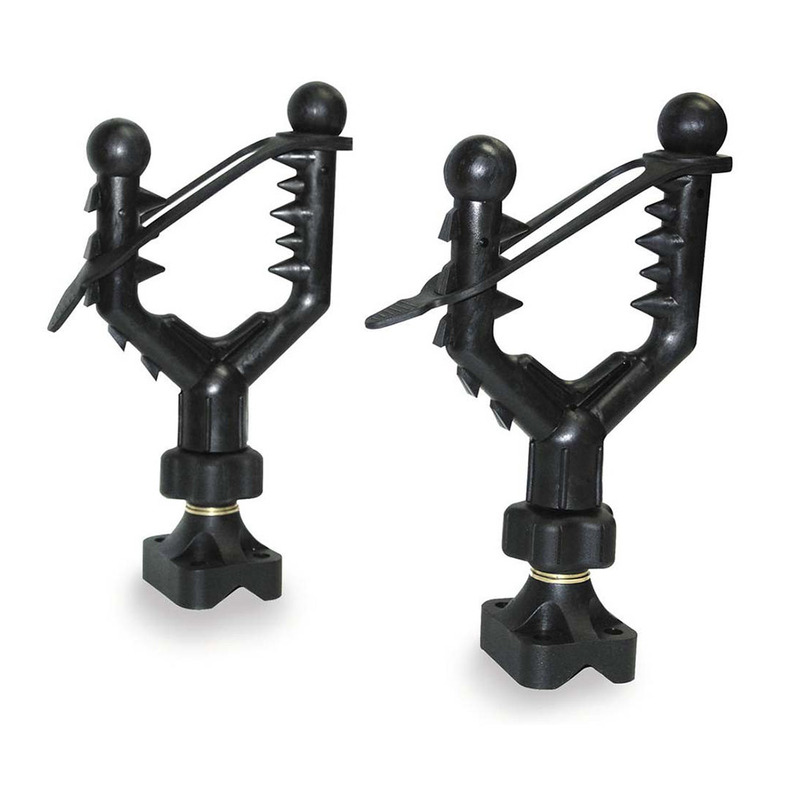 This is a no nonsense, absolutely fail proof, totally functional, totally dependable gun rack that features two sets of holding cradles. I can safely mount my rifles almost anywhere in any direction. 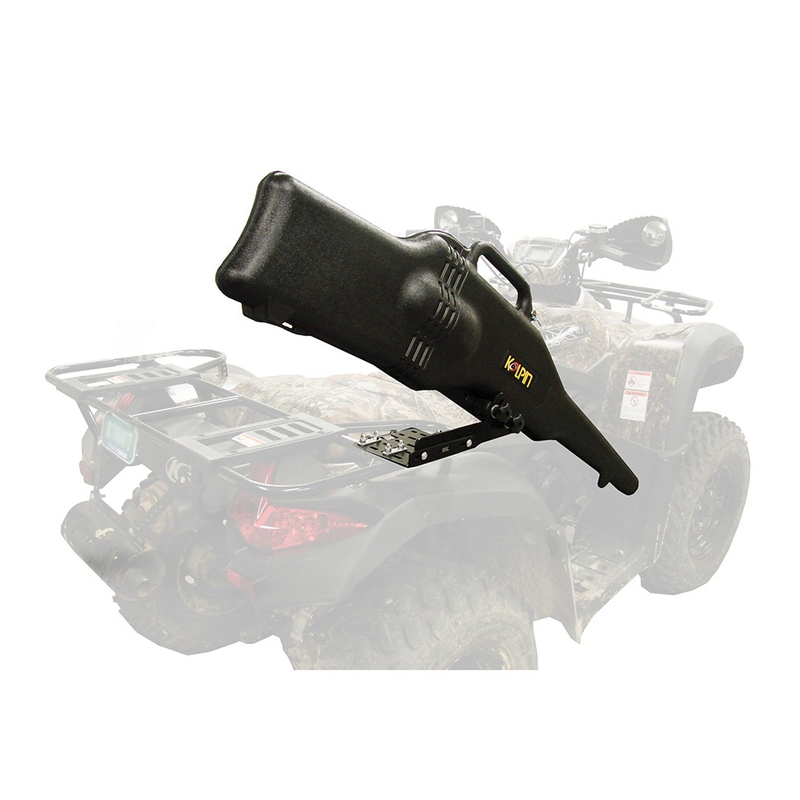 Gun Boot Cases are popular for ATVs since they offer a hard case for protection and typically come with all the required mounting hardware. Gun boot cases provide a universal fitment on most ATV racks and UTV roll bars, so it's easy to choose the right boot for your rifle needs. Kolpin offers a Gun Boot Case with a Shock Absorbing Liner that features an ergonomically designed handle and molded attachment points for a sling, with the bracket and all mounting hardware included. 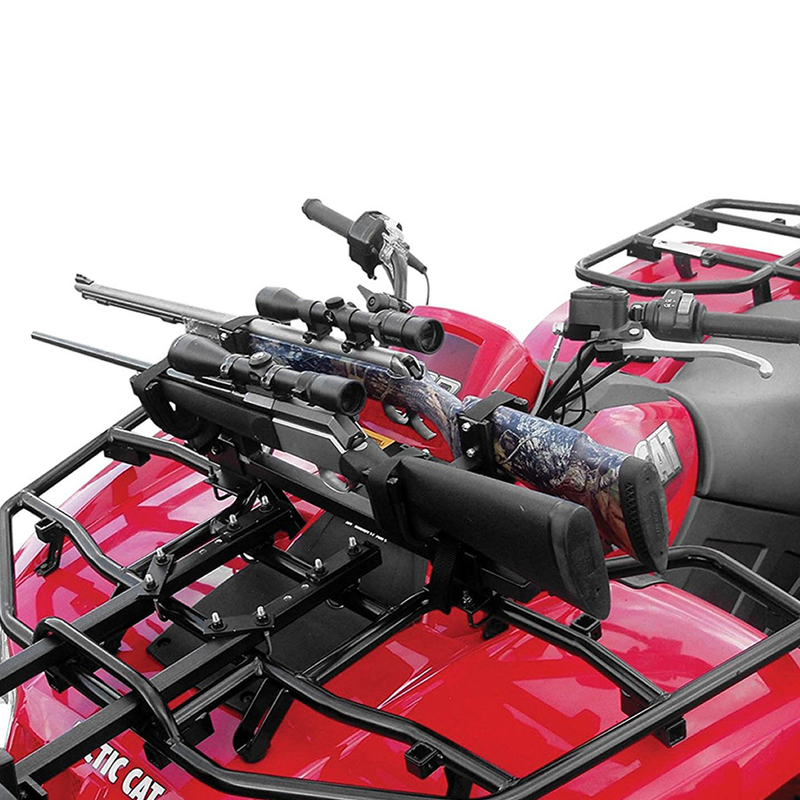 Since UTVs have pushed their way into the market, there's a big demand for Gun Racks on UTVs. Fortunately, a UTV has a lot more mounting locations to put various kinds of gun racks. 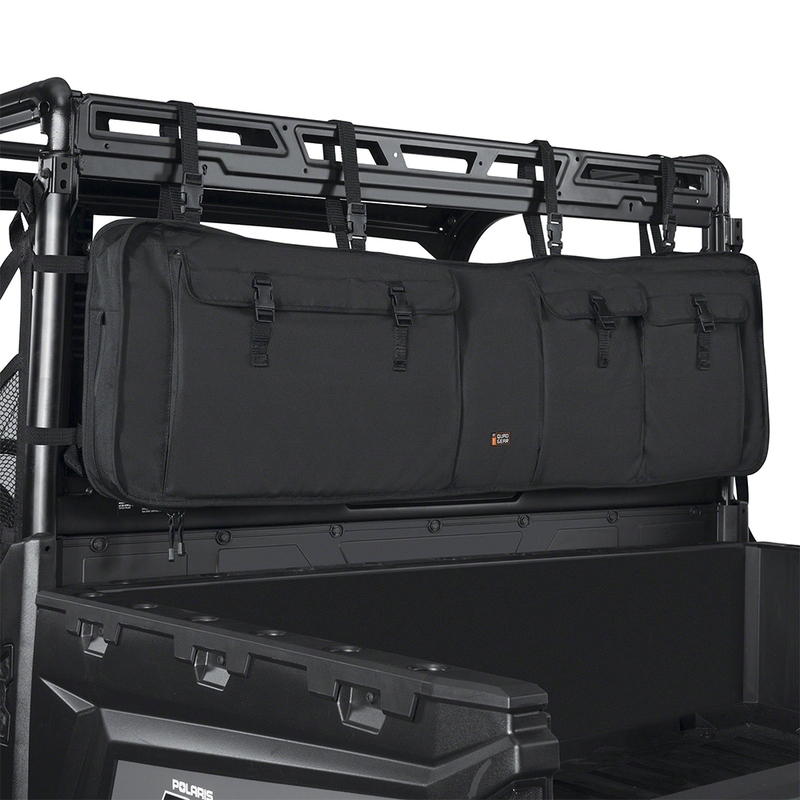 If you're looking from something that's cost effective, while still keeping your rifles completely secured, the Black UTV Double Gun Carrier from Quadgear Extreme is a great way to go. It's a heavy-duty ProtekX Extreme fabric with water-resistant backing and exterior coating for maximum weather and abrasion protection. It fits one rifle or shotgun on each side and three large gear pockets for extra shells or other items. Every hunter knows that half the battle is waiting. Waiting for the right opportunity at just the right time. Well, it turns out that all that waiting can make you hungry. So before you go out a long hunting session, it's a good idea to pack a full day's worth of food so you can manage your post effectively. I like to have as much food as I can with me, with the ability to keep it cold all day long. For an ATV, there are a lot of seat bags that you can strap to the back of your quad that have a ton of compartments for storage. Keeping myself unnoticed, I went with the Mossy Oak Breakup ATV Seat Bag from Kolpin. 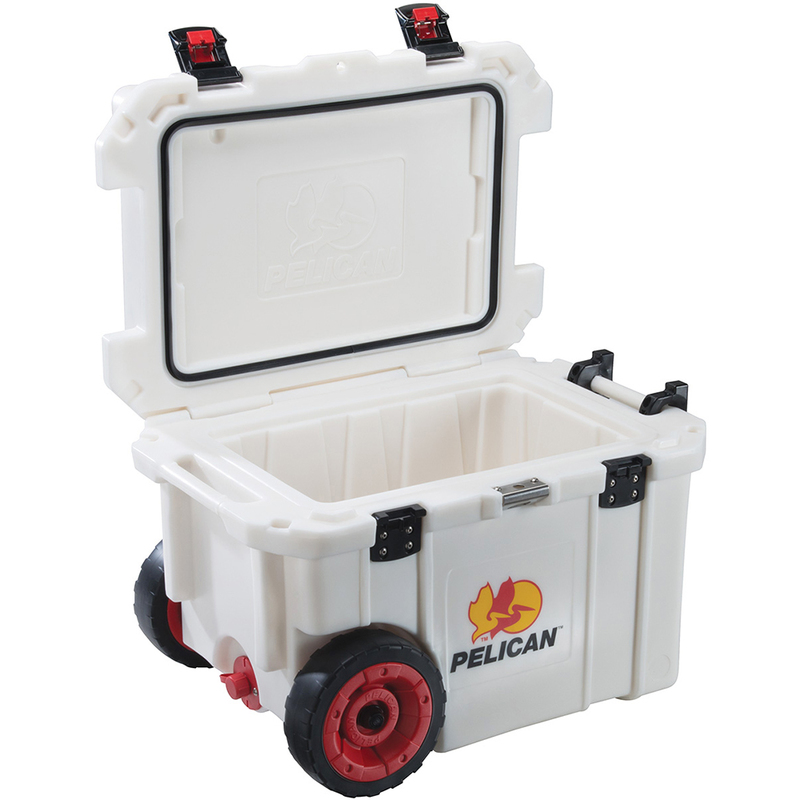 It features a backrest style seat with plenty of padding for added comfort, with enough compartments to hold all my smaller gear and up to a 12-pack of beverages in the cooler. It also has this really cool water bottle holder that zips out when you need it. Kolpin also has a number of different cargo backs, both hard and soft case, that can work on a number of ATVs. If you're looking for a cargo bag that's as big as it's going to get, the Kolpin TrailTec Deluxe Cargo Bag is the largest bag they offer. It easily fits up to 3 adult sized helmets and allows for quick assembly to your vehicle. 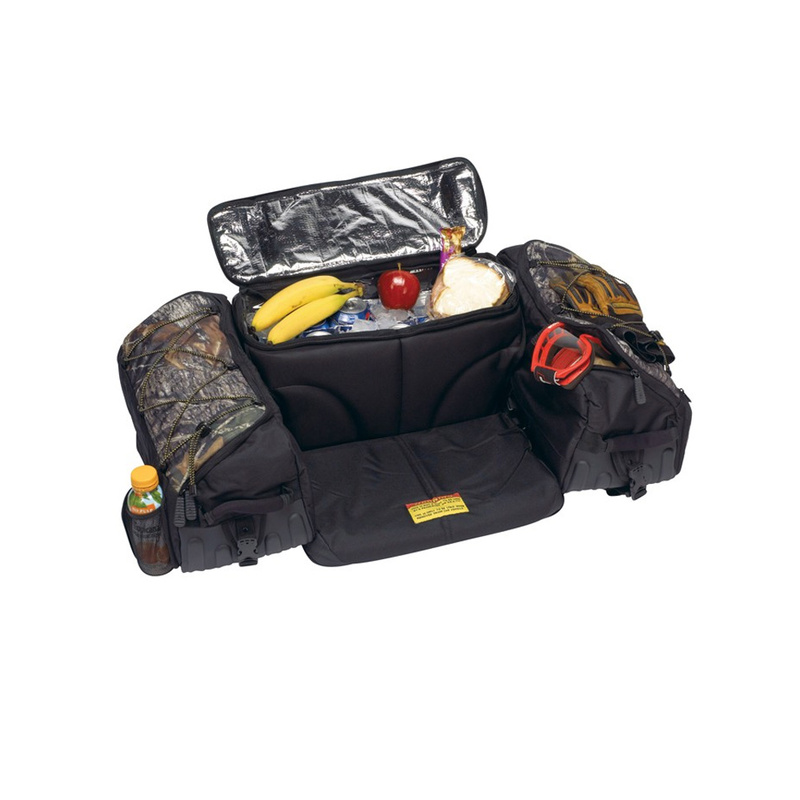 It has a frame that keeps the bags shape and protects your cargo. The backs liner has 300 hours of UV protection built into it and the entire bag gives you nearly 5 cubic feet of storage. 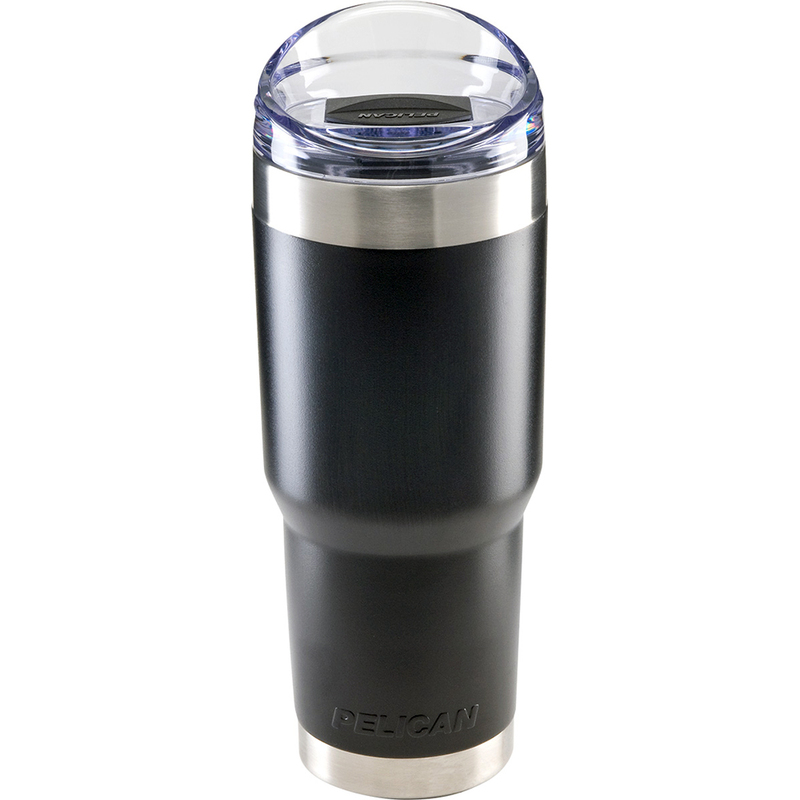 Now, if you are looking for something that offers maximum protection with maximum lifespan, go Pelican. They're a bit more expensive than the traditional luggage but it's easy to see why. Their stuff is so tough that they have labeled their coolers "bear resistant certified". This certification is literally to help keep bears safe and significantly reduce bear-human encounters by ensuring that bears do not have access and become conditioned to anthropogenic foods and other bear attractants that increase these encounters. 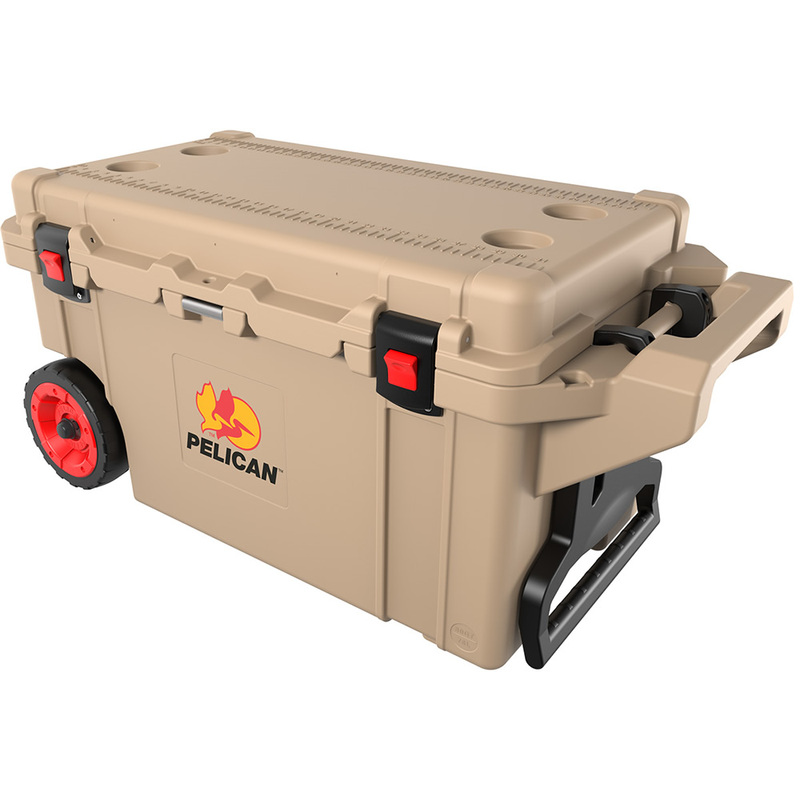 They offer hard-case coolers in a number of different sizes, so if you own a UTV than you can load one of these up for a hunt that will last well into the night. The primary hunting season happens in the colder months of the year. If you get out to your post at dawn, chances are the temperatures are going to be extremely cold. If you're riding a UTV to your location, the temperatures are going to much colder. A great way to keep yourself from freezing is adding a windshield to your UTV. You have a few different options to choose from when you're looking for a windshield. Most manufacturers build their windshields from plexiglass, which not only gives you protection from win, but it can keep you wet and dry from the rain and snow. If you're picking up a windshield for a UTV, Kolpin has a line of windshields that are made from .236" THICK GE Lexan Polycarbonate with abrasive-resistant & scratch-resistant MR-10 coating on each side. Compatible with most after-market roofs. If you're looking for a premium windshield, National Cycle carries a line of UTV windshields that feature thick polycarbonate, providing outstanding strength and impact resistance, and National Cycle's exclusive Quantum® Hard-coating delivers unbeatable scratch resistance. Their Full-Size Wash'n'Wipe 3D Windshield for sport and utility UTVs gives you complete coverage against wind, rain and mud and lets your UTV go anywhere. The high quality, heavy duty washer/wiper motor comes preassembled and installed. Push a switch and your windshield is clean again! Now with a UTV, you may also want to think about a windshield on the back. Quadgear Extreme has a few Rear Windows for the Polaris Ranger and Yamaha Rhinos that are made from super-clear vinyl with heavy-duty black ProtekX Extreme fabric. 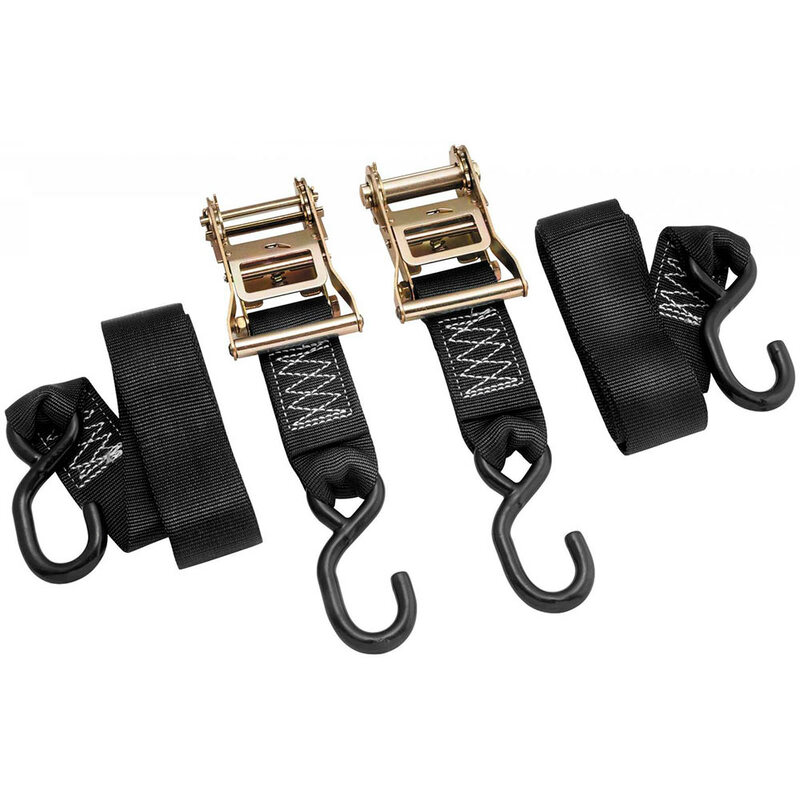 They're made here in the USA and install to the roll cage with four cinch-tight straps and rip-and-grip closure tabs. The same reason you should be using a windshield is the same reason you should have some protection overhead. Not all UTVs have a roof from stock, so it's up to you to find something that's going to fit your vehicle and hold up to the elements you will endure on the hunt. Most of the cabs and roof brands have an roof for your UTV. It's best to determine your budget and work out from there. You can go soft top or a full fledge hard roof top. The best bang-for-your-buck is from brands like Pro Armor and Kolpin. Pro Armor's design is a heavy duty, marine grade vinyl that is UV protected and water repellent. Their roofs are made from black carbon fiber pattern and you have a variety of color choices to match your vehicle. There's also a front zipper mount that not only looks great but works even better due to less fabric to flap in the wind. The rear of the roof extends past the passengers to prevent water from falling on you. Vertically Driven Products are really nice because they have a nylon mesh that keeps air flowing through the cab and keeps wind and dust from entering the cab. Their windstoppers easily attache with straps and buckles to the frame and are constructed of a durable UV treated mesh which offers shade while allowing airflow through. Maier is a premium brand for hard top roofs. Maier uses a proprietary thermoplastic olefinic elastomer (TPO), specifically designed for your machine. This high-impact polypropylene alloy delivers a high-gloss finish with strength characteristics capable of enduring extreme weather and temperature conditions. Maier plastics are UV-stablized, resistent to chemicals and avaliable in a wide array of colors and films. If your home was anything like mine growing up, there were knick-naks everywhere. There's no reason why the ATV or UTV you take with you hunting should be any different. Remember, it's the little things that can often make the biggest difference. If you're using an ATV to go out on the hunt, you might want to blend in a bit. 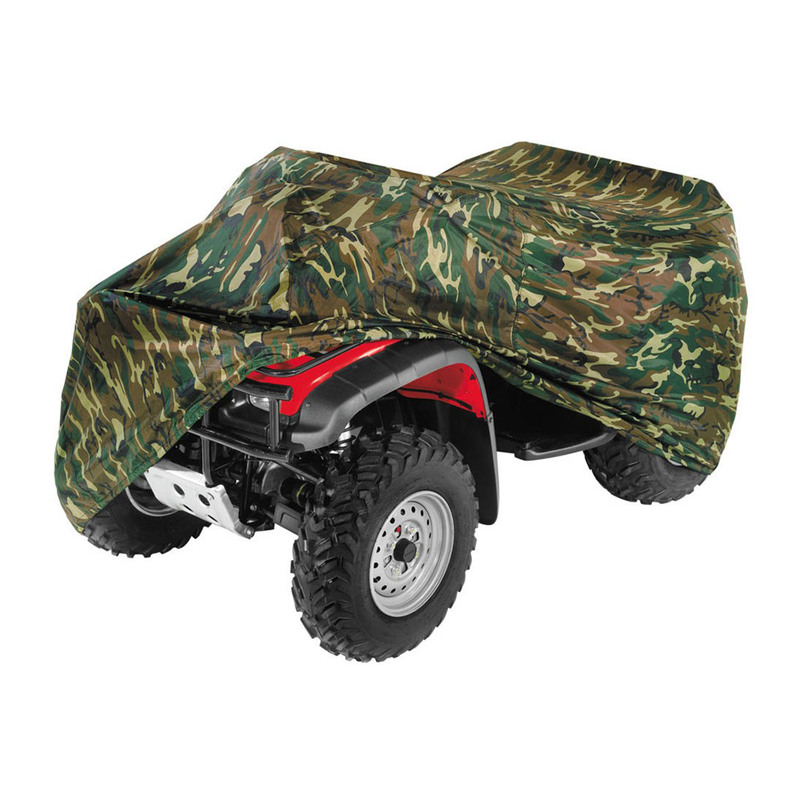 QuadBoss has an ATV cover that will protect your quad from the elements and the unexpected perils of storage with this cover. Their 2XL size fits units with attached drop baskets, mesh racks, plows, spreaders, etc. Plus, a handy storage bag is sewn into the cover. Even when you're not hunting, tie-downs are an important asset to always have with you. BikeMaster has three different size ratchet tie downs available, and we found that their 2" x 84" was the most versatile for what we're using. These are heavy-duty nylon straps and are a great deal for the price. Finally, load up on a good medical kit, just in case the hunter turns into the hunted. Yikes! 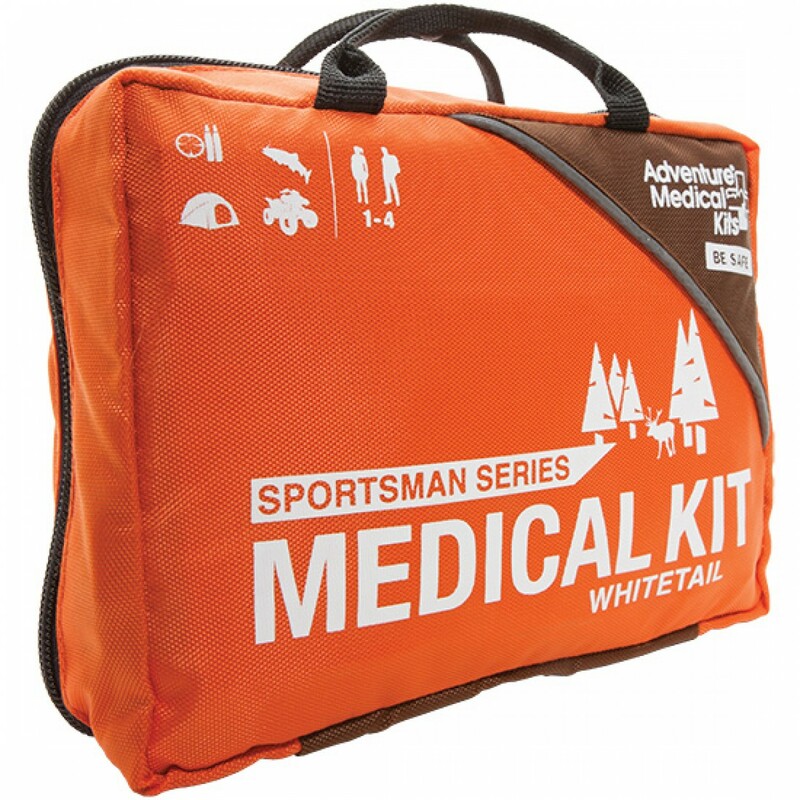 Smart Travel has a great Sportsman Series Medical Kit that's designed for recreational hunters and fishermen on trips up to four days long, the Whitetail contains supplies to treat the most common injuries, including penetration wounds from bullets or arrows, fish hook removal, stabilizing sprains, and stopping severe bleeding.